With Valentine’s Day just around the corner, it’s hard to resist the plethora of sweets in beautiful reds, pinks, and whites. It’s around Valentine’s Day that I yet again regress and yearn for those childhood days when everyone would make boxes and fill them with Power Rangers and cartoon valentines. I may have just dated myself a bit too much there but it really was fun, opening up your box and checking out all the cards and candy. Thankfully I was brought up in classrooms where everyone had to get valentines for everyone else in the classroom. There was never any disappointment! Well except for those years where you would find out your crush did not feel the same way for you as you did for him. However, despite a little sadness, there was always some candy hearts and cookies to cheer you up! This could be why I was a bit plump in my younger years…. Anyway, I wanted to capture all my favorite Valentine’s Day flavors in this oh-so red cookie sandwich. Red velvet is, like, the quintessential Valentine’s Day food for me. Aside from chocolate of course. But chocolate is always around in my life. It’s more of a way of life than a special treat at this point. 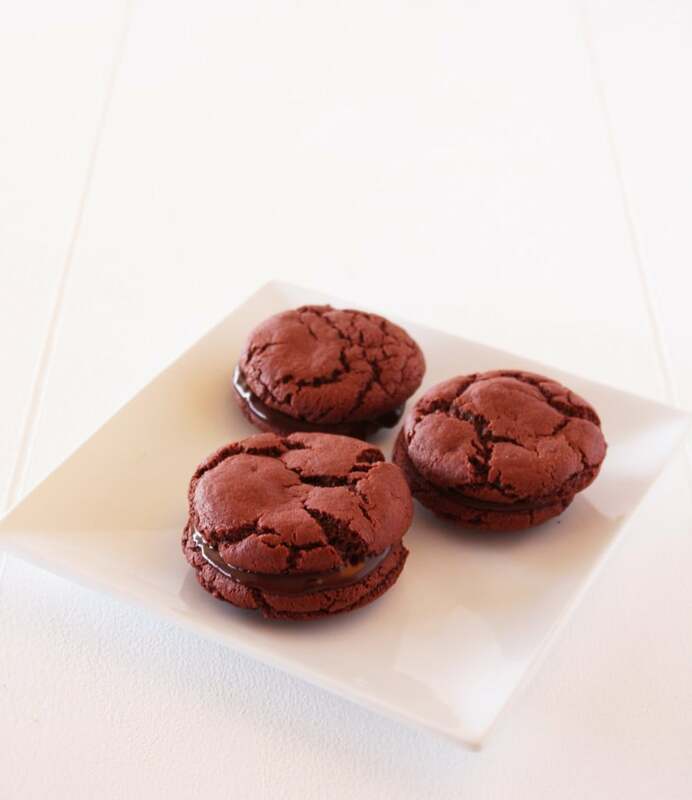 Back to red velvet… These cookies capture that soft, rich red velvety goodness. Oh and then I decided to stuff some dark chocolate ganache in between two of them. One cookie at a time really isn’t any fun is it? Especially on a day that screams for sweets and decadence and love!! So share these gorgeous little darlings with your loved ones and watch their faces light up as they stuff their faces. Or hoard them all to yourself while watching rom-com movies in PJs. 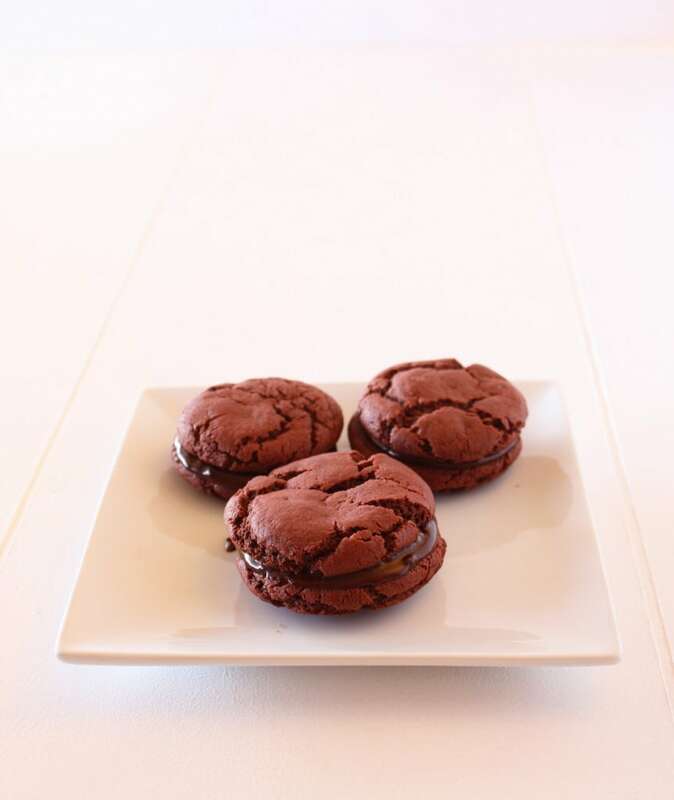 Soft, chewy cookies with a sinfully rich chocolate filling. Make the ganache filling by adding the dark chocolate chips to a medium bowl. Heat the heavy cream in a medium saucepan over medium heat until it begins to simmer. Do not let the cream boil over. Remove from heat and pour the heavy cream over the chocolate chips. Let stand for about 1-2 minutes. Stir the heavy cream and dark chocolate chips together until the chocolate melts and the mixture comes together as a creamy frosting. Set aside and allow to rest at room temperature for 1 hour. Mix flour, cocoa powder, salt, and baking soda in a medium bowl and set aside. Beat butter in a stand mixer (or with an electronic hand mixer) until creamy. Add both sugars and beat with the butter until combined. Next add the milk, vanilla, egg, and food coloring and beat until combined. Then add the dry ingredients (flour, cocoa, salt and baking soda) to the mixture in small batches and beat until all the dry ingredients are incorporated. Set the dough in the refrigerator and chill for an hour. Chilling the dough really helps the final texture of the cookie, trust me! Once the dough is chilled, preheat the oven to 350 degrees. Form small balls of dough (about a tablespoon and a half) and add to a lined baking sheet. Bake for 10 to 11 minutes. Remove from oven and allow to cool completely on wire racks. After the cookies have been cooled, you can make your cookie sandwiches. 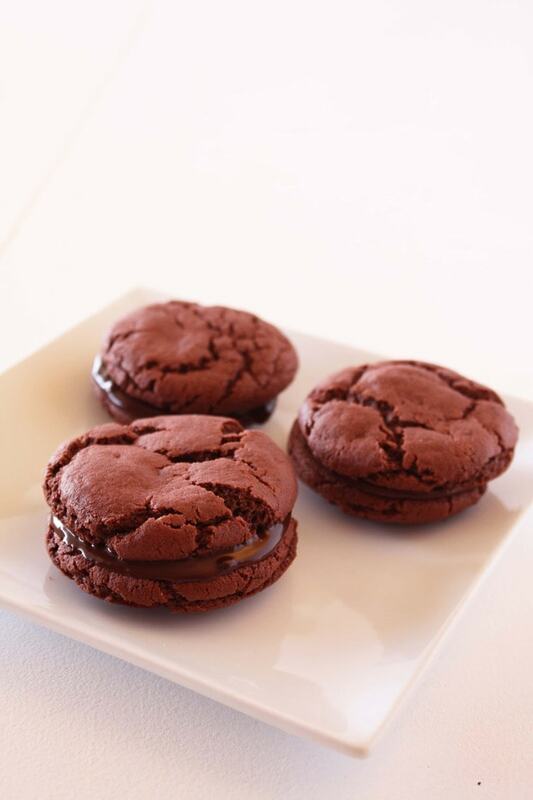 Add a small dollop of ganache filling to the center of the bottom of a cookie. Top with another cookie and push together so the ganache spread evenly. Repeat this process until all of your sandwiches have been made. 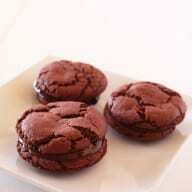 Allow cookies to rest for about 30 minutes before eating.